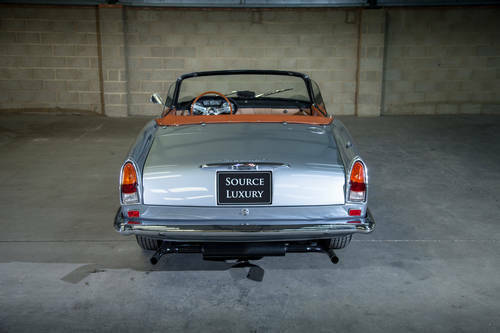 We are delighted to offer for sale this very special 1960 Maserati 3500 GT Vignale Spyder chassis number AM101 997, once forming part of the Jean-Claude Bajol Collection. 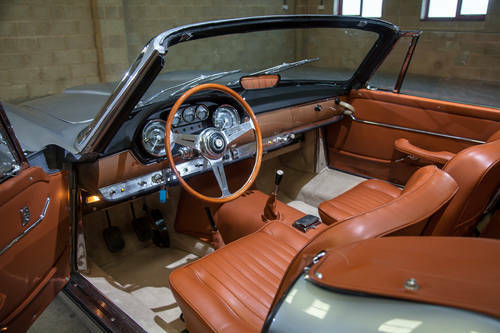 Limited production to just 242 examples the majority in Left Hand Drive, this matching numbers example could be the finest for sale today, finished in the striking Argento Luna over Tobacco Leather and recently restored to an impressively high standard. This model is the 4 speed with front disc brakes, rear drum brakes and showing just 16,651 kilometers. 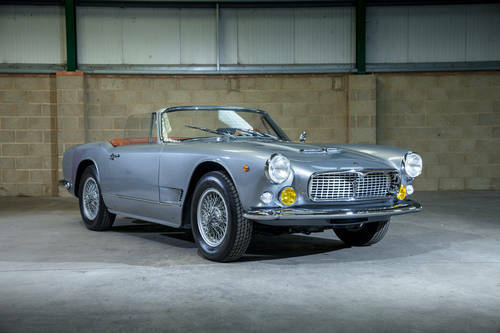 This Maserati 3500 GT Vignale Spyder is an ex Jen-Claude Bajol Collection. The French collector Jean-Claude Bajol, who died in 2012, was an important Ferrari collector in France and had owned all the ‘greats’ (Ferrari ‘Comp’ SWB, 0763GT Ferrari 250 TdF and 3451GT Ferrari 250 GTO). Sold new in Portugal in August 1960 to Mario de Carvalho Vinhas. The second owner acquired it in 1977, after which it passed into the hands of Jean-Claude Bajol. Presented in it's original colour Argento Luna with Tobacco Interior. One of only 15 Carburettor models with 16" Borrani wire wheels and hardtop. Presented at the Geneva Motor Show in March of that year, it was immediately accepted into that exclusive category of the high class 'Gran Turismo'. The success of the 3500 GT Coupé was soon followed by a demand from its customers, especially in the United States, for an open-top version. 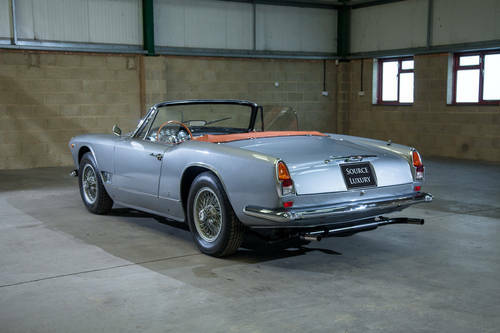 As early as 1957, Frua produced a Spyder prototype on an early 3500GT chassis. In 1958 Carrozzeria Touring produced two open-top versions. 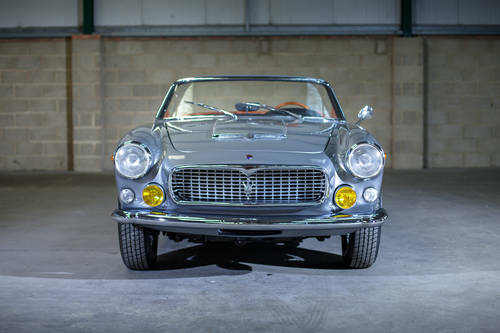 But, it wasn't until 1959 that Maserati found the design they were looking for when Carrozzeria Vignale produced a Spyder, based on a design by Michelotti. The Vignale Spyder went into full production in early 1960 and mechanically it appears to have followed the same upgrades as the 3500 GT. Early models had disc brakes on the front wheels and drum brakes on the rear wheels.&#8232;&#8232; Unlike the 3500 GT which was bodied in all aluminium, hence the use of the word 'Superleggera' (Superlight), the Spyder Vignale's body and doors were made of steel, for added strength, but the bonnet and boot lid were made of aluminium, to save on weight. Maserati's chief engineer Giulio Alfieri had modified the competition six cylinder engine from the Tipo 350S sports racer for road use and incorporated some major components from leading European manufactures. &#8232;&#8232;For the power unit Maserati adopted the 3500GT's twin overhead camshaft six cylinder engine fed by three twin choke 42 DCOE Weber carburetors had a cubic capacity of 3,485 with a compression ratio of 8.5 to 1 developing some 220 bhp at 5,500 rpm (reduced slightly from the prototype's figures of 226 bhp at 5,500 rpm). &#8232;The Vignale Spyder adopted identical mechanics as the 3500 GT, save for a modified chassis with its wheelbase now reduced by some 100mm. The shortened chassis required that a smaller fuel tank be installed. Behind the driver and passenger seats there was only room for two very small rear seats. The manually operated retractable hood being concealed in a space behind these occasional seats. The chassis frame was a multi-tubular structure of high-duty steel giving the car a total dry weight of 1300 kg. &#8232;&#8232;The front suspension was by coil-springs and wishbones with a torsion anti-roll bar and rear suspension by semi-elliptical leaf-springs and live rear axle.&#8232;&#8232;A steel detachable hardtop, Borrani chrome wire wheels and rear disc brakes were available as an optional extra (later to be fitted as standard equipment). 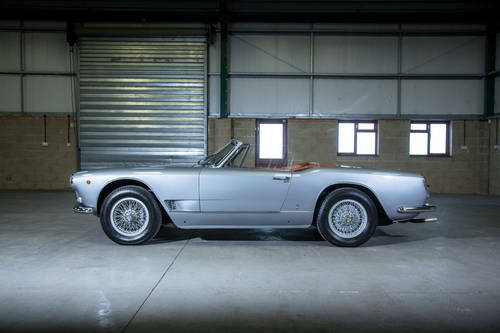 Over riders can be found on some Spyders that were destined for the US market and Maserati name Dean Martin as one of the famous celebrities who owned a Vignale Spyder. 1961 Maserati 3500 GT fully restored condition!